The Crab Shack on Royal Princess is a specialty dining event featuring fresh shellfish in an informal setting. Informal and casual, the focus here is on the freshly-cooked food. Do not search the ship's deck plan for a venue called the Crab Shack. Like the legendary village of Brigadoon, the Crab Shack only materializes from time to time, usually only once a cruise. When it appears, it takes over a section of the Horizon Court for the evening. The atmosphere of the Horizon Court changes somewhat when it becomes the Crab Shack. 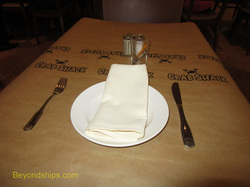 The lights are dimmed and large pieces of brown paper are used to cover the tables as table clothes. A couple of crayons are left on each table so you can doodle on the brown paper. It is a popular event and so conversation from the nearby tables obscures the soft background music. In short, it is a very relaxed and casual atmosphere. While during the day the Horizon Court is a buffet restaurant, when it becomes the Crab Shack, it has waiter service. During our visit, the service was attentive and friendly. The waitress even helped us with the Crab Shack apron. We did not find the apron to be really necessary but it does help to lend the experience more of a feel of dining at a seafront eatery. The menu is not complex. The first two courses are set and so everyone has the same things. A basket of popcorn shrimp and hush puppies serve as the appetizer. These are are served with three sauces - - tartar, cocktail and Bayou. Quite spicy but very nice. For the soup course, you have Manhattan clam chowder. This is an enhanced version of the classic red soup with bits of bacon and with clams still in their shell. While unconventional, the soup was nonetheless very tasty. Guests have a choice of four entrees. Each of these is a pot full of shellfish, vegetables and sauces that have been boiled together in the pot in which they are served. The main difference between the entrees seems to be which types of shellfish inhabit the pot. We selected the Steamed Alaskan King Crab Legs with Old Bay Peel and Eat Shrimp. As expected the crab legs were very flavorful. However, what was unexpected was the flavor of the corn on the cob and the potatoes. Freshly cooked, they were bursting with flavor. The crab legs arrive in the shell. Thus, you have to use the shears and nutcracker in order to get to the tender meat inside. It involves some effort but is worthwhile. Along the same lines, the shrimp come in their shell. Although the meat inside was good, we found pealing the shrimp to be too much work and so left most of them uneaten. To enhance the meal, the Crab Shack provides drawn butter. Following the example of a nearby table, we also found that ketchup worked well as a condiment. For dessert, the Crab Shack offers a selection of cakes from Royal Princess' nearby Pastry Shop, a hall of desserts located within the ship's buffet restaurant. Good cakes but the quantity of food provided by the Crab Shack during the earlier courses leaves little room for dessert. Above: Popcorn shrimp and hush puppies in a basket. Above: The main event . Below: A cake from the Pastry Shop. Throughout the cruise industry, the cruise lines have been looking for ways to utilize their buffet restaurants in the evenings. These restaurants occupy a large portion of a ship. They are very popular during the day but once evening comes, most guests abandon them in favor of the main dining rooms or the specialty restaurants. Some of the lines have attempted to use sections of their buffet restaurants as upscale specialty dining venues. But the problem with such attempts is that these venues do not have the atmosphere necessary to support an upscale dining experience. With the Crab Shack, however, Princess has hit upon the right formula. The food is premium quality and thus consistent with a specialty venue. In addition, the theme of the restaurant demands an informal and casual setting that is consistent with dining in a ship's buffet restaurant.